I have/had a wallet with Blockchain.info containing 2 bitcoin addresses. One address contained 0.33 BTC. Yesterday when I wanted to access my wallet, for whatever reason, I couldn't remember my password, so I thought, no issue, I just can re-enter my wallet using my 12 words, so I did. I tried to recover my wallet with these 12 words and I was given another wallet (another wallet ID I mean). The problem here is that I cannot see my funds and my known bitcoin address! I can import the bitcoin address (as I can for any address but then it is 'read only'). Can someone explain me / help me how I can recover my funds? These funds have always been in my old wallet (former wallet-ID). First go to Electrum and download the wallet from there. Then install & open that wallet. 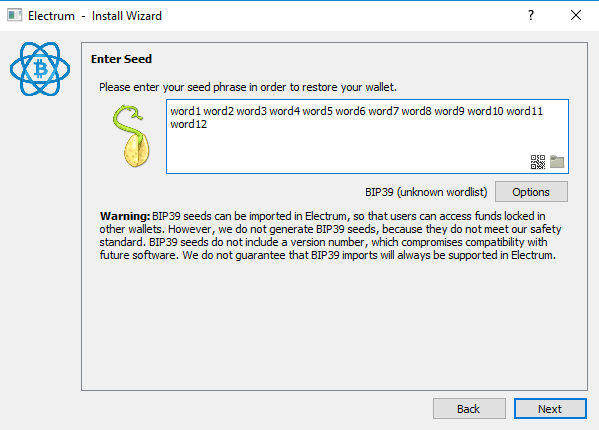 While opening, select "standard wallet"
Then select "I have a seed"
After that click on "BIP39 Seed"
Then the wallet will have your BTC with the same address. Same recovery phrase to two wallets?